Since moving to South Derbyshire around half a year ago it’s been pretty good realising there’s so many places within easy reach of home where live music is happening. 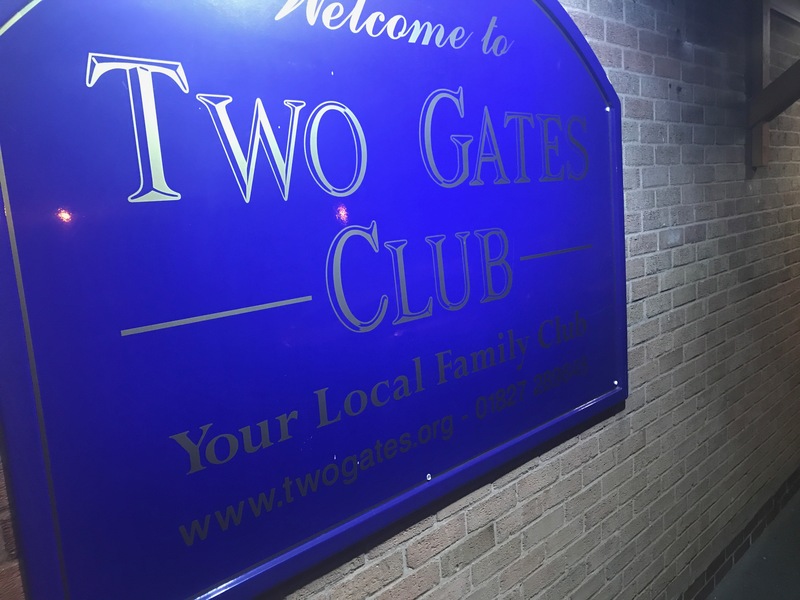 Admittedly gaining access to Tamworth’s Two Gates club threatened to prove difficult – a members only establishment requiring you to be nominated and seconded by existing members to gain access. Luckily an email explaining I’d just like to go to the gig rather than join secured a couple of tickets on the door. The sat nav did less well at finding it, but eventually we rocked up in the car park then over to the chippy for some tea. Once in the venue, rather than the Eyes Wide Shut type scenarios or masonic lodge we’d imagined it was perhaps something more reminiscent of Peter Kay’s Phoenix Nights. 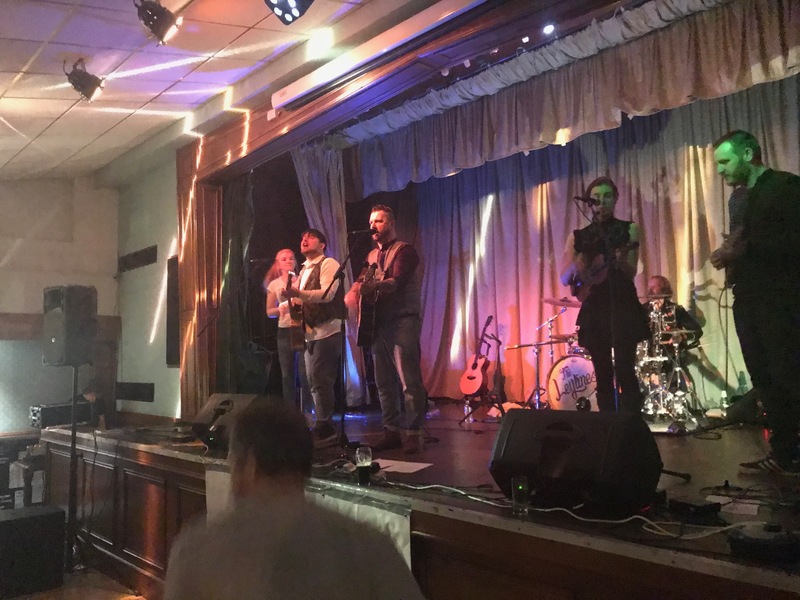 A traditional social club with a lovely welcome – we got ourselves checked in, paid up and found the soundcheck underway – giving us a chance to grab a drink and catch up with Nick and the Black Thorn collective who were waiting their turn to get underway. Soon enough Clakka, Mark, Russ and Ann arrived too so we had some kindred gig-going spirits with us! Nick Parker was up first – it did have a bit of a feel of a family party with some background music on for much of the room – we’d positioned ourselves in the sweet spot for the sound system though so the chatter didn’t distract me at all from listening. It was a crisp sound too – kudos to Dan for that. After a swift soundcheck he kicked off with Departures – gradually luring in a decent number of the crowd into abandoning their conversations and taking in the clever lyrical interplay. I’ve Never Been to Dublin Before was next, and Down with the Yoof definitely got laughs from the crowd – so they were paying attention! There’s a video coming out for that song on 1st April which I’m really looking forward to seeing (I think!). The room perhaps threatened to be a bit of a Make Yourself at Home type night, but luckily it wasn’t (the backstory being Nick thinking he’d been booked for a support slot but was actually just told to busk in a foyer and left feeling somewhat out of place!). It didn’t turn out like that here, it wasn’t just our table who were taking in his performance! Back to his older back catalogue Metaphor was up next – I remember that being one of the songs that really hooked me into Nick’s music. He’d tried to coax some of the kids present to help with the placards for Es Tut Mir Leid (aka The German Song) but only succeeded in bringing big kids Russ and Clakka to the front – once they got the hang of it though they did a lovely job of holding up the subtitles for the chorus to give everyone a chance to sing along and learn a bit of German into the bargain! He finished up a pretty brisk set with Terry and June, it was an ‘in off the pink’ kinda evening – I’ve no idea why I’ve fixated on his colour choice in that song, haha! I really ought to ask him about it one day. It was a really nice set – the sound was really clear and despite protestations of needing to tune partly through but not having a tuner handy it sounded great to me, and really powerful sounding vocals too. We popped out for a quick vape-break outside whilst Black Thorn were setting up – it was pretty warm in the room, and chilly outside – so balancing your time between the two you could achieve a pleasant temperature! It only occured to me when chatting with Ella on the way to the gig that I’ve not seen Black Thorn live since Deerstock last year – they played Farmer Phil’s too but I missed their set whilst I had a strange bout of short-term illness. Of course, they’ve released a superb album in that time, so I was looking forward to seeing how some of those tracks translated to a live setting. Cabin Fever kicked off the set just as it does the album – and well, you certainly get the intricacy of the album coupled with the energy of a live setting. Psychic Sally followed – again as it does with the album – I love the fusion of folk and dance music that they manage to create. Considering percussion comes from a kick drum Joel uses and a tambourine on a high-hat stand Jack uses. Silhoutte was up next followed by Vin Rouge where the smoke machine built into the kick drum seemed to come to live, puffing plumes of smoke with each drum beat. A multi-sensory experience! Josie introduced her cornet to give some brass to this one too which really adds another dimension (and is quite a diversion from the accordian!). Since Ferocious Dog were off in Cardiff it was great to hear their interpretation of Hell Hounds with Adam taking lead vocals for this one – it’s great because it’s really pretty faithful to the original, but with an undoubted Black Thorn overlay to it. Nobody really wants a straight cover, but a thoughtful one is always welcome! Fat Freddy was next which again takes so many cues from dance music as well as folk, I can’t think of anyone creating a sound quite like Black Thorn at the moment, it’s really innovative, catchy and just clever stuff. Signature tune Catch Me If You Can was next – and then another cover (I discovered, I’ve heard Black Thorn play it before, but must confess I wouldn’t have been able to place Drinking From The Bottle as a Calvin Harris feat. Tinie Tempah song!) – Josie takes the verses before the chorus kicks in, having done a quick bit of revision on the original it’s again, a recognisable but undoubtedly Black Thornified rendition. Festive was a timely reminder that the festival season kicks off pretty much next week (woo hoo!) before they finished up the set with Slaves. So good to have caught them again! I must admit I was a tiny bit gutted not to see how The Human Rave might’ve translated to a live setting – I’m sure there’ll be time for that over the course of the year. Joel is also running the recording facilities at The Black Market Venue outside of band work. Their album Butter Side Up is testimony to his production skills and innovation – so I’m excited to see the kinds of projects he might unleash upon the world from there – not least that he’s currently working with The Star Botherers on their forthcoming release. That really is exciting! 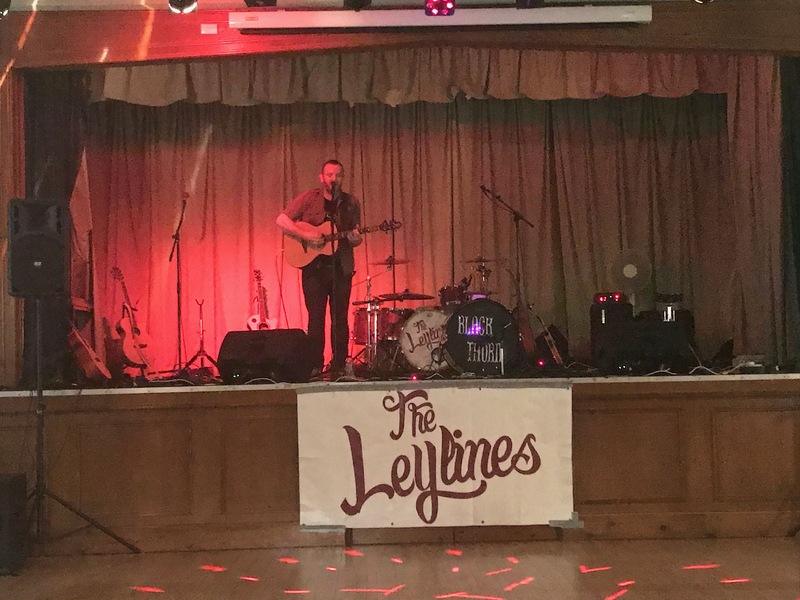 Then came The Leylines – launching into Stone Circle they drew a few people to utilise the sparsely populated thus far dance floor, and then straight into You’ve Changed. As for all the sets the PA was delivering the good superbly, it didn’t look like a massive set up for such a large room, but it was doing a great job. Sorry My Friends was next – the band were full of energy (which is pretty standard to be fair!) and despite Steve having issues with his in-ear monitors it didn’t detract from the performance from where I was listening! New song In Your Shadow has a really effective and foreboding guitar-picked intro from Matt and some pretty haunting vocals from Steve, eventually kicking in with a bit more energy. There was a brief pause for Matt to drag his cousin to the front for the room to sing happy birthday to him – which was pretty amusing. 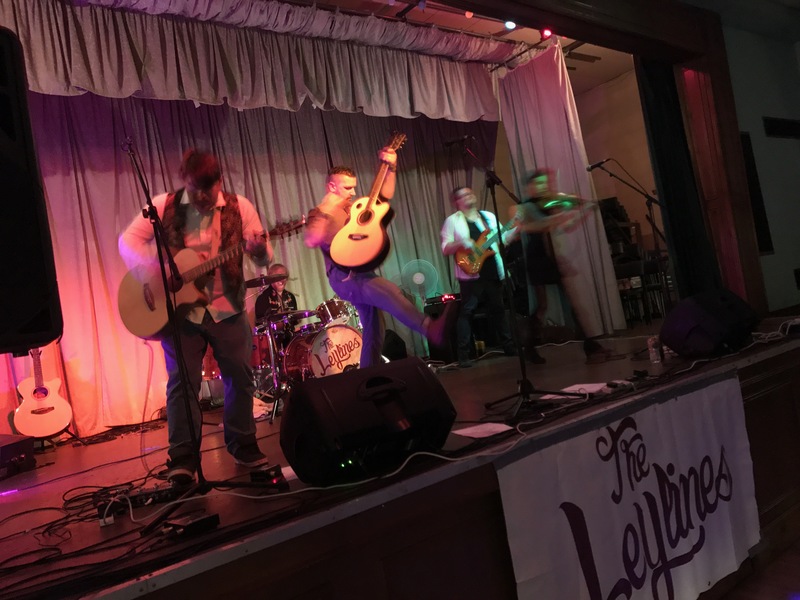 Let It Go has become a pretty staple anthem in The Leylines’ canon and didn’t disappoint here, followed up with Save Your Soul – a powerful song with it’s melodic beginnings kicking into a full on instrumental onslaught as it builds up. 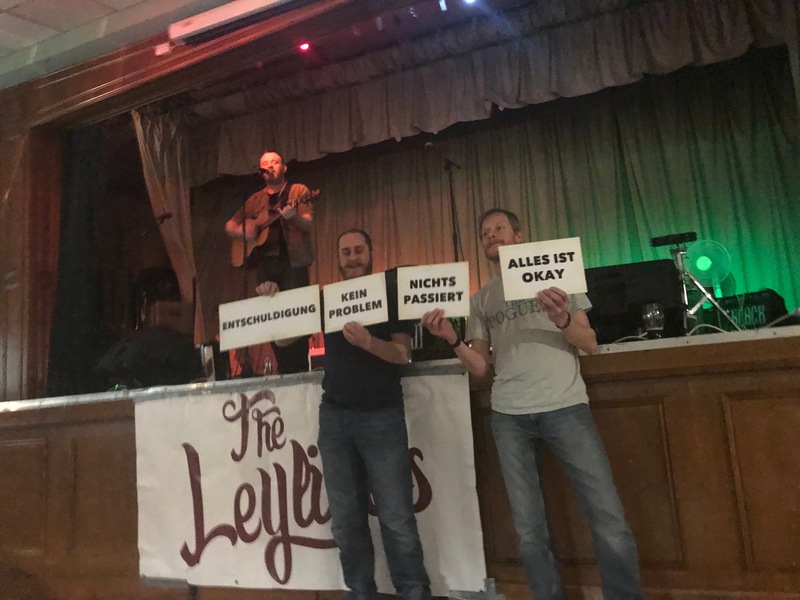 Another new song Standing by the Waterside is becoming increasingly familiar with every listen – one Steve’s had kicking around for a while apparently but needed some Leylinification, it certainly seems to have done the trick for me! Highlight of the set for me was My Own Worst Enemy – the energy, passion and everything just seemed to hit a perfect storm. “Fahkin’ ‘ell that was a bit good” exclaimed Mark in the crowd as Hannah finished up the soaring fiddle instrumental at the end. It was pretty special, I’m not going to lie! 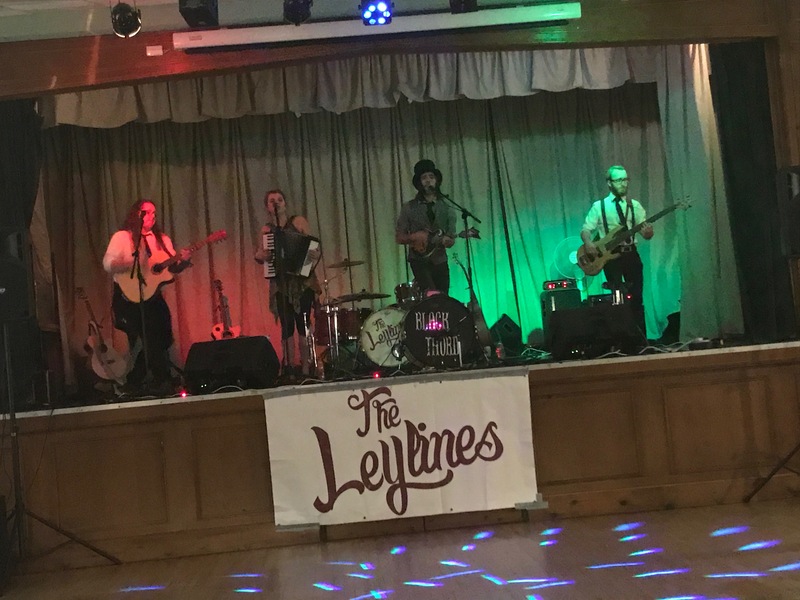 Long Way From Home was dedicated to folks who’d travelled to the gig from far afield – by my normal standards this was a pretty local gig, but plenty of folk had made lengthier journeys too (not least a Weston Super-Mare contingent!). Fly Away is another new song which I’m less familiar with – it’s good to hear so much new material being road-tested in a live setting though. Nick joined them on stage with his mandolin for Things I Know, an empassioned protest against the government, then it was Hannah’s Song which as yet still doesn’t have a name (I’m thinking Be The Best you Can might be a good alternative). For Queen and Country is always a highlight for me of a set by The Leylines, and this was no exception – such a powerful song lyrically and musically. Ella and Nick made the band up to a seven piece for Run for Cover, with Russ, Ann, Mark and Clakka literally doing shuttle runs infront of the stage, leaving time for a rousing encore of festival anthem Sat in a Field. It won’t be long until we’re doing just that, I really can’t wait! We had a chance to goodbye our way around the room before getting home within half an hour – result! 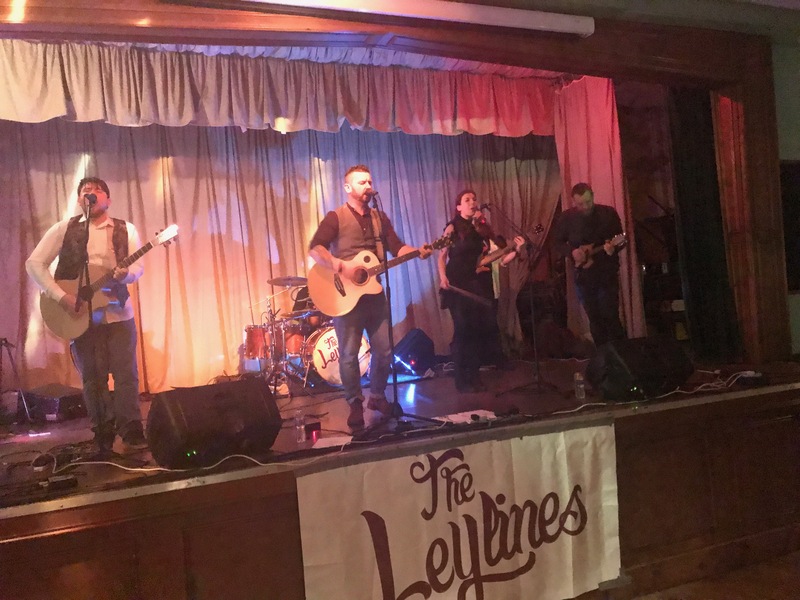 What a great triple header of a line-up that was – and we’ve got more Leylining for us tonight, this time with Leatherat in support.. awesome!